Waybill from a dealer in the UK for a June, 1874 Evansville wharf-boat outfit that I bought primarily for the unique engraved vignette. Looks like there were 2 emblematic/decorative stacks attached to the far side the roof of the wharf-boat itself. Those superfluous stacks were distracting at first and it took me a while to figure out why they might have been there. The artist may have based the engraving on a photograph, but if so I couldn't find it the Murphy collection. The letters "QU" are on the pennant of the 2nd boat from the left. Could have stood for QUEEN or QUINCY. 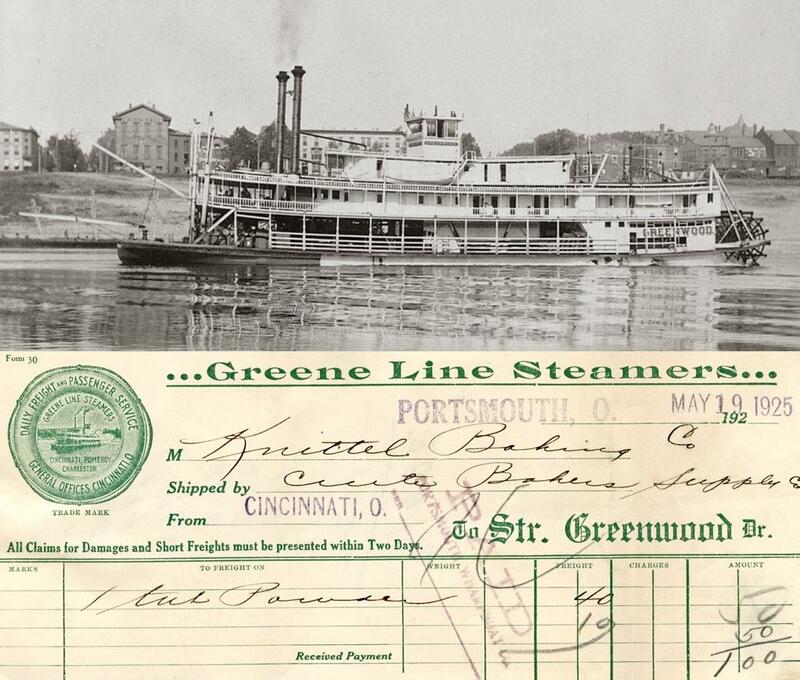 Also included in the auction were 2 waybills from April of '72 and April of '74 for the steamboat BERMUDA, whose name is on the wharf-boat waybill. Detail - vignette from 1874 waybill (above) issued by J.E. 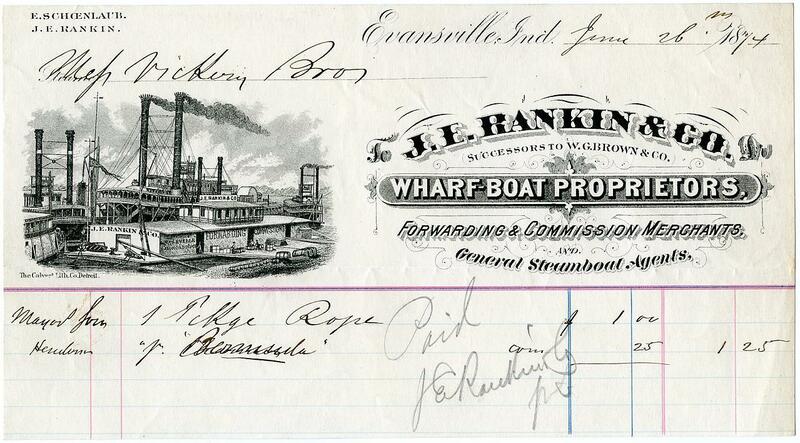 Rankin & Co. Wharf-Boat Proprietors, Forwarding & Commission Merchants and General Steamboat Agents of Evansville, Indiana. Engraver may have based this on a photograph. 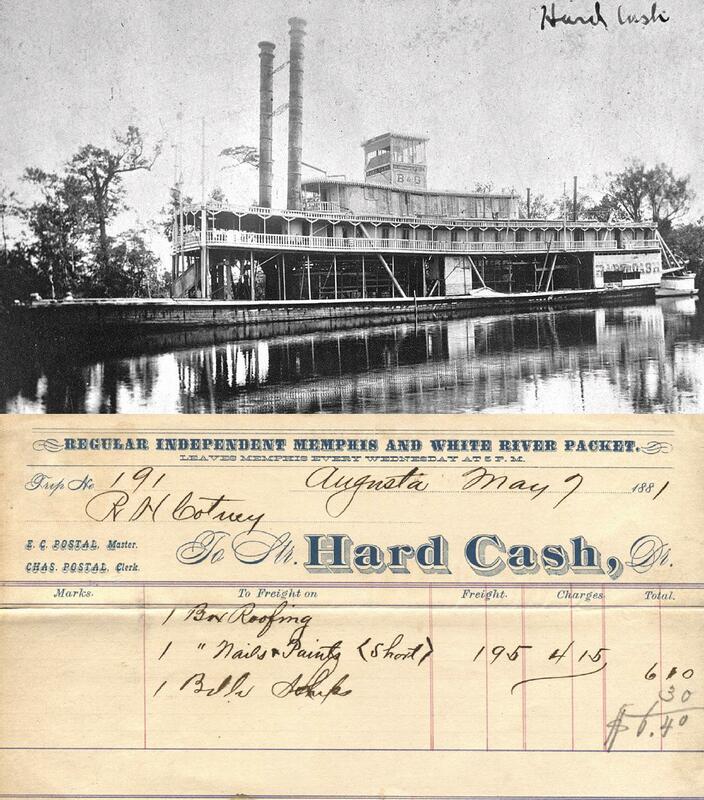 Attached the wonderfully named HARD CASH downloaded from Murphy's online digital collection. She was retired in 1909 and laid up in Bayou Sara Creek, Alabama after operating for most of her career on the Tombigbee and Warrior Rivers in Alabama. The photo was taken at Bayou Sara in 1910. Four years later she was dismantled. The HARD CASH was built way back in 1876 and worked for over 30 years, a very long run for these fragile boats. She looks almost like a caricature of a steamboat, looking exceedingly long and tall, couldn't have operated on rivers with low bridges with such tall stacks. The waybill I just purchased dates from her Memphis and White River Packet days in 1881. I always liked that jaunty name HARD CASH, although my favorite boat name was STACKER LEE. There's a popular old "folk/blues" song sometimes called STACKER LEE but apparently the song predated the boat and was initially pronounced "STAGGER LEE" for the real "killer" who was called "STAG" Lee. 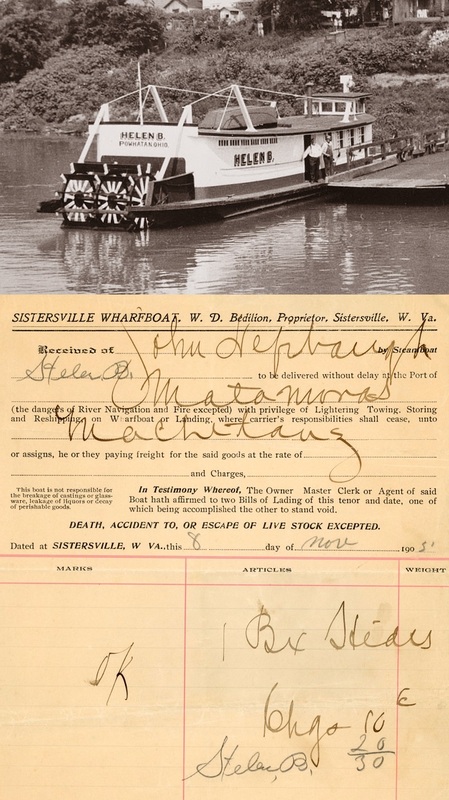 This receipt for goods received at the Sisterville, West Virginia wharfboat is dated sometime between 1900 and 1909 "by Steamboat" HELEN B. which is strangely written twice in the upper left and lower right. Although I gathered that the first letter was supposed to be an "H" it also looks like whoever wrote it was meaning to write the letter "S" which suggests that the boat's name would have been "Stelen B" but it's uncertain. For want of positive identification I have put the La Crosse image of the Towboat/Ferry/gas boat HELEN B. whose home port was Powhatan, Ohio. This a quaint little craft is the most likely candidate under the uncertain circumstances. 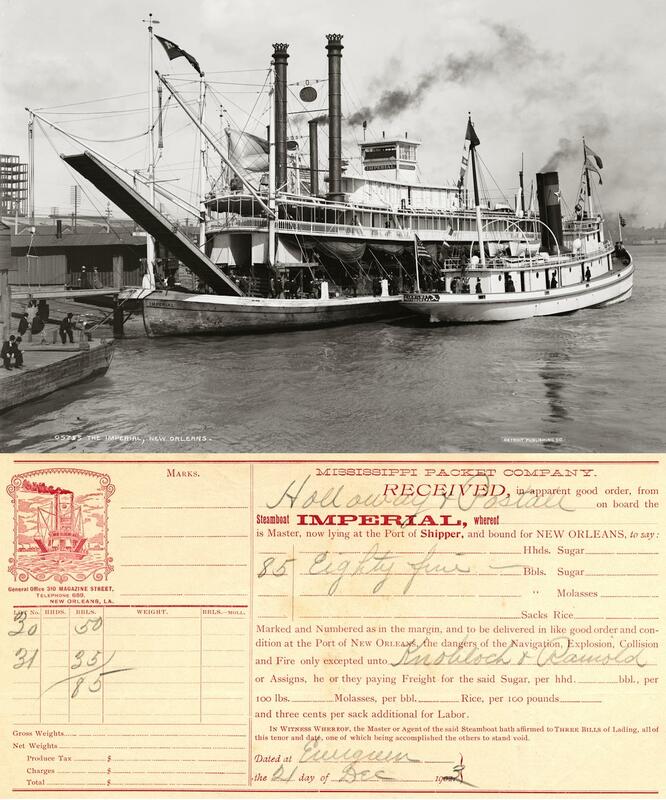 Waybill dated 31 July 1886 (the year that the LIZZIE BAY made her maiden voyage on the Ohio River). Photo from La Crosse. Built in 1886 at Madison, Indiana She came out in the Parkersburg-Middleport trade but soon entered the Pittsburgh-Charleston trade. About 1890, she was lengthened and a texas added. 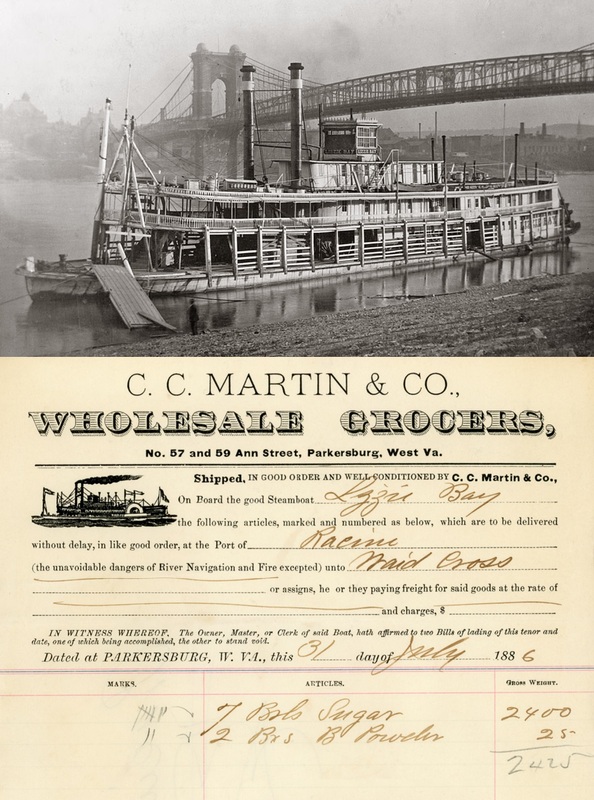 She knocked down her stacks and pilothouse in February 1893 when she failed to back while landing at the Parkersburg wharfboat at the mouth of the Little Kanawha River and hit the Baltimore & Ohio bridge. After joining the White Collar Line, she ran Cincinnati-Madison but also sometimes upriver. On December 8, 1905, she hit a coal barge at Ludlow, Kentucky and sank. In June, 1909 she sank again at Cincinnati at the foot of Main Street. Dismantled at the Howard Ship Yard in Jeffersonville, Indiana in 1912. After she was dismantled, her engines and part of the cabin went to the building of the CORKER. The LIZZIE BAY was popularly known as the "Lousy Liz"
Came out new in the Cincinnati-Madison trade replacing the sidewheeler BEN FRANKLIN. The weekly statement above was tallied up by a clerk named Barker on October 3rd, 1885. Sank shortly before noon on January 1, 1891, having backed into a fleet of coal barges when departing the Madison wharfboat. A rising river soon finished her. (The photo of the sunken PIKE is from the LaCrosse collection). CITY OF HUNTSVILLE WAS A 238 TON SIDEWHEELER BUILT AT ELIZABETH, PENNSYLVANIA (ON THE SOUTH BANK OF THE MONONGAHELA) IN 1852 AND SANK 6 YEARS LATER AT PALMYRA ISLAND, 36 MILES BELOW VICKSBURG ON THE MISSISSIPPI 12 MAY, 1858 WITH THE LOSS OF 8 LIVES. HUNTSVILLE, PENNSYLVANIA WHICH IS INLAND, NORTH OF THE SUSQUEHANNA RIVER IN PENNSYLVANIA. Built by Capt. Robert Taylor of Higginsport, and named for a son at Higginsport, Ohio 1893. One boiler 40" diameter by 20 ft.
Taylor ran her briefly from Madison, Indiana to Monterey, Kentucky, up the Kentucky River. Delivered new barges built at Madison for the U.S. to St. Louis and Natchez fall 1895. Ran Gallipolis-Huntington for several years. Capt. E.E. 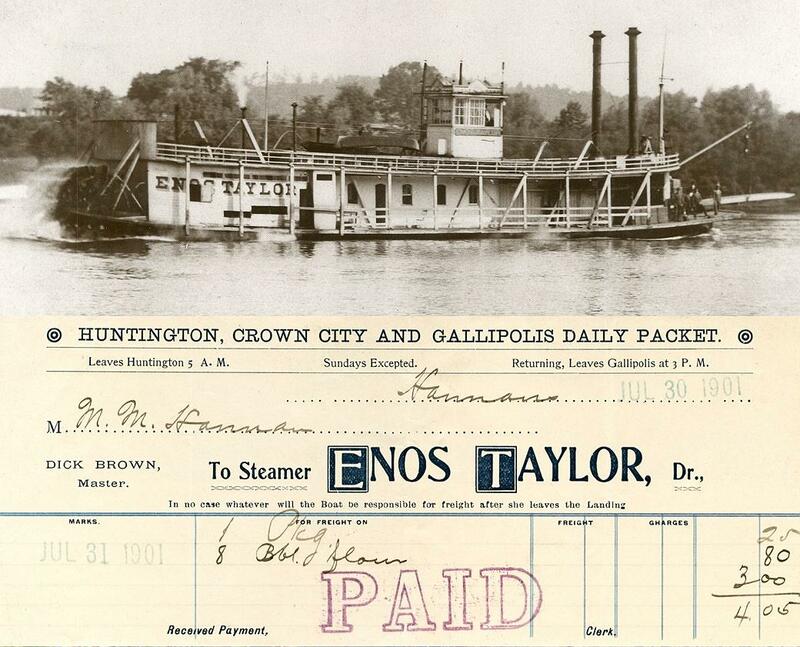 Eisenbarth bought her in February 1902 and towed his showboat with her through the 1904 season, then sold her to the Bruns-Bokersox Lumber Co., Shawneetown, Illinois to tow logs out of the Wabash and Saline rivers. Burned at De Koven, Kentucky on March 15, 1912. Built at Jeffersonville, Indiana by Howard in 1894. 210 x40.6 x 6.6. Engines, 18's- 7 ft. Three boilers. Paddlewheels 22 ft. dia. working 28 ft. buckets. She was a cotton carrier built for the Scovells (W. T. , Matt and Noah) to bring cotton out of Red River to New Orleans. 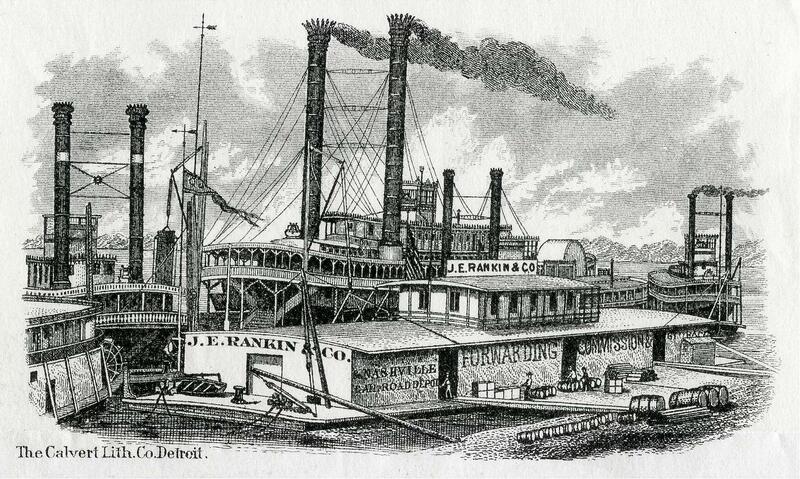 The Mississippi Packet Co. acquired her, J.B. Woods, president and general manager , and ran her New Orleans-Bayou Sara. Her master in 1902 was Capt. John M. Burgoyne. She ran in the cotton season and often was retired in the summer months, the ST. JAMES handling the trade. Made a Mardi Gras trip from Monroe, La., to New Orleans in Feb. 1911, and was laid up some 16 months when she sank due to the swells from passing tug boats on June 16, 1912, and burned the next day. She had equipment from the DACOTAH which was dismantled at Howard's at the time she was built. Her engines were from the TACOMA. Her staterooms were removed in the fall of 1936 to allow her to carry automobiles. She had bad luck with shafts, in all broke seven of them, and ran through herself about a dozen times. She was withdrawn from service in February 1947. The photo from the LaCrosse collection was taken in 1941 on the Ohio River at Terminal Facilities Riverside, Greene Line Terminal at Louisville, Kentucky, left bank, mile 377.3. In 1925 she was chartered to replace the Betsy Ann. 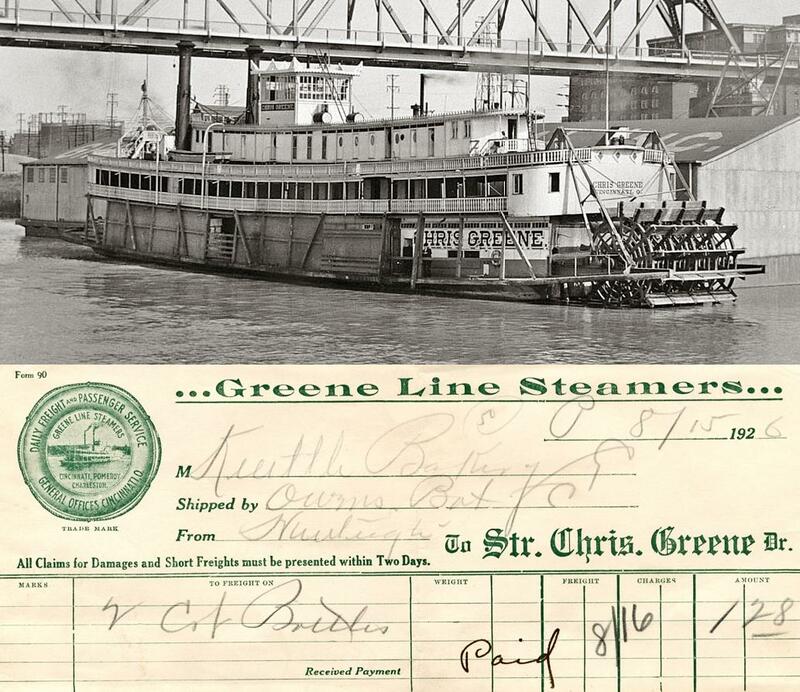 On November 17, 1925 the CHRIS GREENE backed into her and her hull was ripped open, she then turned over and landed below the suspension bridge in Cincinnati. Built at Wheeling, West Virginia in1864 by the Sweeneys, who were reported to have sold her to Captain Pink Varble of Louisville that November. During the late 1860's, she ran in the Louisville-Florence, Alabama trade, under Captain Milt Aiken, master, with J. Morgan Smith, clerk. Captain Sam T. Jones, Rockport, Indiana, and others ran her Cincinnati-Evansville, and she was last owned by Capt. Tom Ryman, Nashville. She was dismantled in 1876 and the hull used as a wharfboat at Brandenburg, Kentucky.